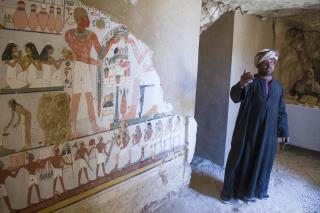 (Newser) – Egypt on Saturday announced the discovery of two small ancient tombs in the city of Luxor dating back some 3,500 years and hoped it will help the country's efforts to revive its ailing tourism sector, the AP reports. The tombs, located on the west bank of the Nile in a cemetery for noblemen and top officials, are the latest discovery in the city famed for its temples and tombs spanning different dynasties of ancient Egyptian history. "It's truly an exceptional day," Antiquities Minister Khaled al-Anani said. "The 18th dynasty private tombs were already known. But it's the first time to enter inside the two tombs." Al-Anani said the discoveries are part of the ministry's efforts to promote Egypt's vital tourism industry, partially driven by antiquities sightseeing, that was hit hard by extremist attacks and political turmoil following the 2011 uprising. The ministry said one tomb has a courtyard lined with mud-brick and stone walls and contains a six-meter burial shaft leading to four side chambers. The artifacts found inside were mostly fragments of wooden coffins. Wall inscriptions and paintings suggest it belongs to an era between the reigns of King Amenhotep II and King Thutmose IV, both pharaohs of the 18th dynasty. The other tomb has five entrances leading to a rectangular hall and contains two burial shafts located in the northern and southern sides of the tomb. Among the artifacts found inside are funerary cones, painted wooden funerary masks, clay vessels, a collection of some 450 statues, and a mummy wrapped in linen who was likely a top official. A cartouche carved on the ceiling bears the name of King Thutmose I of the early 18th dynasty, the ministry said. Ridding themselves of radical Islam would bolster the flagging tourist market. Until then, pound sand. Ironically, they never used the Cleopatra story as part of their tourism. Why? She was Macedonian Greek. They definitely should make it safe for tourists. I would love to see these tombs. They are so beautiful. That art is what draws you to them. just breathtaking. No other archeological sites have ever come close to the beauty of ancient Egypt.